Below you can view all the homes for sale in the Peccole West Queensridge subdivision located in Las Vegas Nevada. Listings in Peccole West Queensridge are updated daily from data we receive from the Las Vegas multiple listing service. To learn more about any of these homes or to receive custom notifications when a new property is listed for sale in Peccole West Queensridge, give us a call at 702-930-8014. Master up w/sitting area, view balcony, hers&his closets & marble vanities, Jacuzzi tub, & steam shower. Theater room. Office. Pool & spa. MLS#2089382. Rob Jensen Company. Features include: An open living space* Gourmet kitchen w/ island, granite counters, upgraded cabinetry & stainless steel appliances* Custom family room fireplace & built ins* Beautifully landscaped backyard w/ pond & waterfall* No neighbor behind home* Pride of ownership is evident throughout! MLS#2089133. Desio Realty Group. The backyard is lush and green with large mature trees, a backyard you can enjoy. MLS#2089463. Realty ONE Group, Inc.
A former residence of an Interior Designer, this home is optioned & upgraded beyond most of the other homes in the neighborhood. MLS#2089277. Pegasus Properties. Located Minutes From Great Restaurants And Shopping. Immaculate Property! MLS#2087052. Realty Executives Experts. Office w/access via front patio. Wine room w/wet bar. MLS#2085332. Rob Jensen Company. Estate offers a full court tennis/sport court, state of the art theater, gym, elevator & resort style pool & spa! Recently painted & move in ready. MLS#2086773. The Tom Love Group LLC. Backyard perfect for entertaining in summer & winter with a covered patio, inground heated pool & spa. MLS#2085708. Monarch Property Management &. Stunning Lanai opens to your outdoor oasis w/ custom curved doors on 3/4 acre lot MLS#2080791. The Tom Love Group LLC. Master retreat offers a seating area and balcony. See it today! MLS#2080204. Keller Williams Market Place I.
Exits to COVERED PATIO, PUTTING GREEN & PEBBLE-TECH POOL/SPA. Versatile DEN. MLS#2080360. Black & Cherry Real Estate. Gourmet kitchen dazzles with granite counter tops, island, and Viking appliances! MLS#2076435. Coldwell Banker Premier. This Is By Far The Best Home Available In QueensRidge. MLS#2076087. Easy Street Realty Las Vegas. Perfect for entertaining, waterfall pool & spa, gorgeous outdoor kitchen island w grill & EVO hibachi. MLS#2075127. Icon Realty. Built in cabinets in garage for storage. MLS#2070594. Integrated Real Estate LLC. Covered patio, built-in BBQ, pool w/ spa & fountain. MLS#2069213. Keller Williams Southern Nevada. 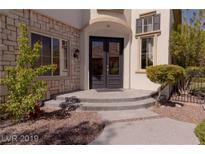 Hoa Awesome Resort Style Amenties With Fitness Ctr/ Pool/Spa/Tennis Cts/Bbq Area! Meeting Areas!must See!! ! MLS#2069104. Topper Properties. Great floor plan for entertaining and huge kitchen overlooking the beautiful yard! MLS#2068123. Keller Williams Realty Las Vegas. Two Guest Beds W/ Large 2nd Bath, Laundry Rm W/Sink & Cabinets, Shutters T/O, Tile, Hardwood & New Carpet In Fam Rm & Guest Beds, Gorgeous Landscaping, Corner Lot. Comm Pool MLS#2067604. Urban Nest Realty. Three car garage with ample storage area. MLS#2064710. BHHS Nevada Properties. Plenty of storage with an oversized two car garage, slate floors and high ceilings make this home! MLS#2061421. Elite Realty. Kitchen with Large Island, Granite Countertops, Breakfast Bar, Walk-In Pantry & Nook, Large Loft / Office Area, Master with Sitting Room, 3-Way Fireplace, Marble Bath, Balcony with Amazing Views! MLS#2055222. Jason's Realty. A must see to appreciate as have too many upgrades to mention, lots of opportunities/possibilities to do or have access to the amenities within the community. MLS#2050662. Meridian Realty. 4 bedrooms, 4 1/2 baths. Large cul-de-sac lot, with pool. MLS#2047873. Re/Max Central. Interior is ready to be turned into Dream Home ! MLS#2044913. Elegant Properties, LLC.